​Christian Zamora was born in San Jose, Costa Rica. As a child, his family moved to the United States where he experienced a multicultural upbringing and began studying the violin. At age 13, he studied with violinist, Paul Hatton. By the age of 18, he moved to Madison, Wisconsin in order to study with one of Hatton’s former teachers, the renowned violinist and pedagogue Vartan Manoogian. Christian has held the title of concertmaster for the Bismarck/Mandan Symphony, the Kansas City Puccini Festival Orchestra, the Kansas City Civic Opera, and the Mississippi Valley Orchestra. He was also the associate concertmaster of the South Dakota Symphony Orchestra for seven seasons, where he was frequently featured as concerto soloist. In his chamber music career, Zamora was a founding member of the Yurodivy String Quartet and served as a faculty member for the Kansas City String Quartet Seminar. Zamora assisted in the formation of the Accende Ensemble, a Chicago based chamber music collective whose mission is to advance the work of living composers while maintaining a sense of social consciousness. In 2005, he performed with the Mandragora Tango Ensemble in the Jeune Lune Theatre production of Astor Piazzolla’s opera, “Maria de Buenos Aires.” He was a founding member of Charanga Tropical, a Cuban music collective that is devoted to the performance of Cuba’s Classical Music. 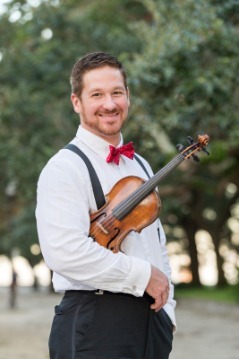 Before moving to Charleston in 2017, Zamora was a professor of violin in Augustiana College, a violin and orchestra instructor at Sioux Falls Lutheran School, and a teacher for the Avera Family Wellness Program, in addition to a private teaching studio, where he worked with students using Suzuki and traditional approaches.